The National Union of Mineworkers (NUM) has today declared a war with the gold producers over wage increases. The employers are continuing to be arrogant, and are negotiating in bad faith. The NUM, together with three other unions, met with the gold sector employers, who negotiate under the auspices of Mineral Council South Africa, yesterday and today on conditions of employment and wage increases. We can confirm that for the past two days, no progress was made and the employers are still far from reaching our member's demands. The employers latest offers are in the region of between R475 and R525 for categories 4 - 8, and between 3.5% and 4.5% for miners, artisans and officials. This is despite the fact that the NUM compromised on its initial demands. The NUM's demands are R9450 for surface workers, R10450 for underground workers and 14.5% for miners artisans and officials. "We regard the offers by the employers as disingenuous. This is indeed a war being declared by the gold producers. 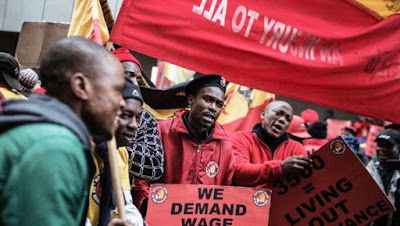 We will take their offers to our members with immediate effect and they are the one who will give us a way forward," NUM General Secretary and Chief Negotiator in the Gold Sector David Sipunzi.